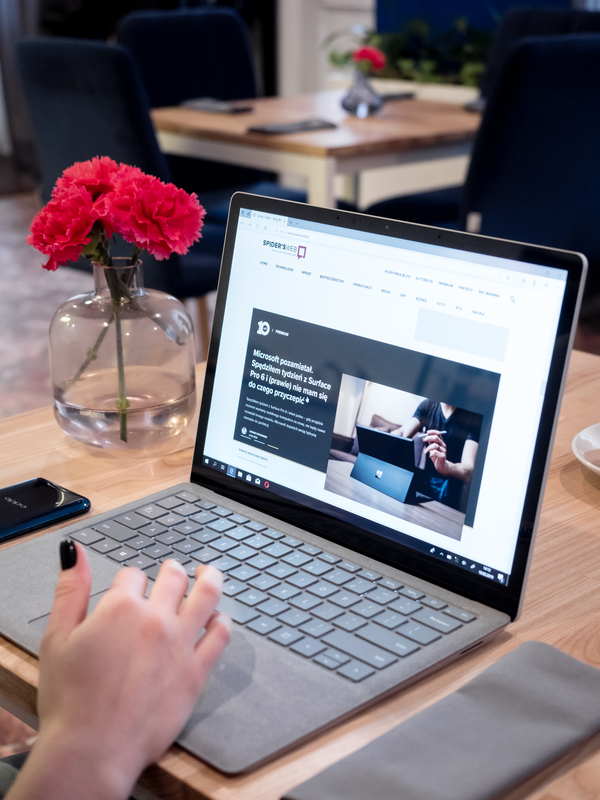 "Live extraordinarily" - with this slogan, Microsoft advertises Surface Laptop 2 , which recently went on sale in Poland. I spent a few weeks with this computer, and indeed - you can say a lot about it, but certainly not that it is mediocre. It is difficult to part with such equipment after testing. Especially that in the world of laptops with Windows 10 a computer which a) is beautiful b) does a great job at work c) it does not cause problems, it is a real rarity. But that's exactly what Surface Laptop 2 is. Maybe it's not perfect. Maybe it has several disadvantages. But there is no other such a special laptop with Windows 10. Surface Laptop 2 is beautiful. Dot. I know that "we do not discuss our tastes" (this is nonsense, after all we discuss it all the time ...), but it is impossible to argue with my objective beauty of Microsoft's computer. Designers really made sure that Surface Laptop 2 enjoyed the eye. From the outside, the device is minimalistic to the pain, and after raising the flap, the unique alcantarra rim appears. How this material will look after years of work - I do not know. It all depends on proper care of the product. 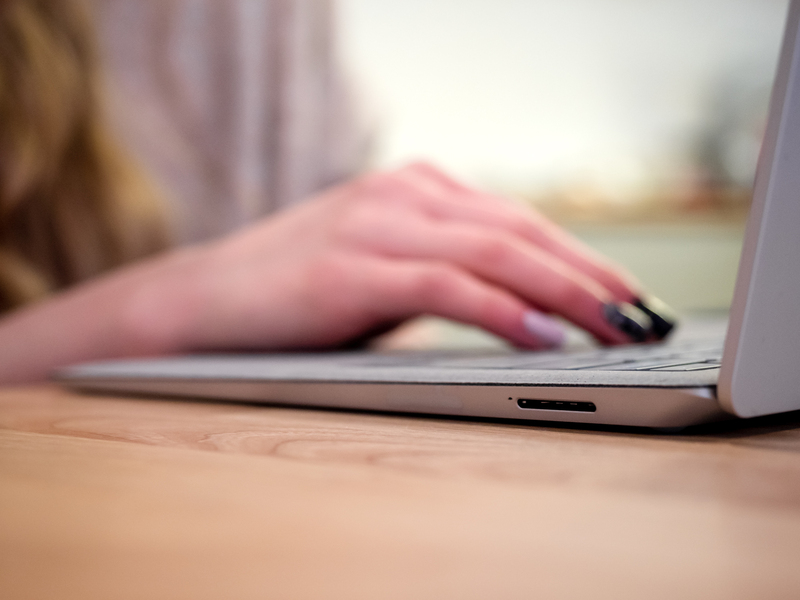 During the tests, however, guaranteed the experience of use that no other computer offers, because instead of cool metal or creaking plastic, the hands land on a pleasant to behold Alcantara. 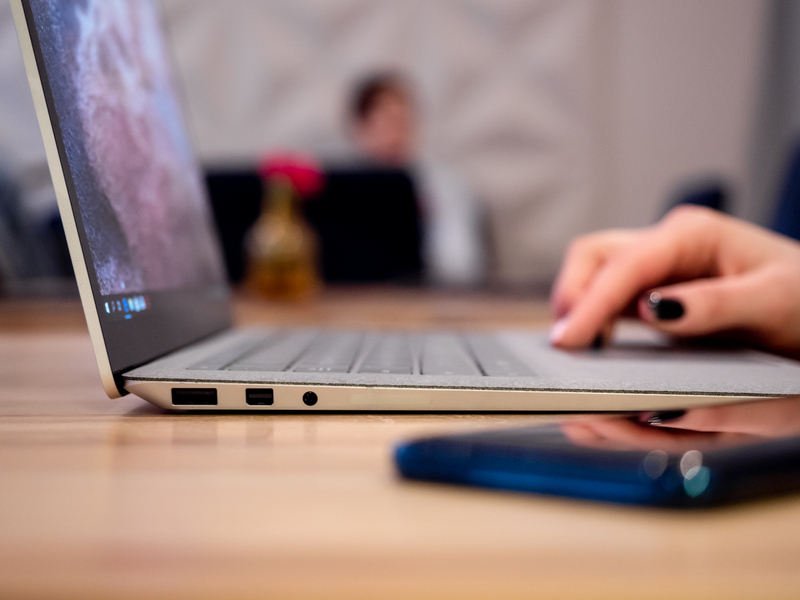 The mass and design of the Laptop 2 also contribute to the overall beauty of the Laptop 2. With about 1.3 kg of weight and only 14.5 mm thick at the thickest point, this computer looks great both while working and lying on the desk. 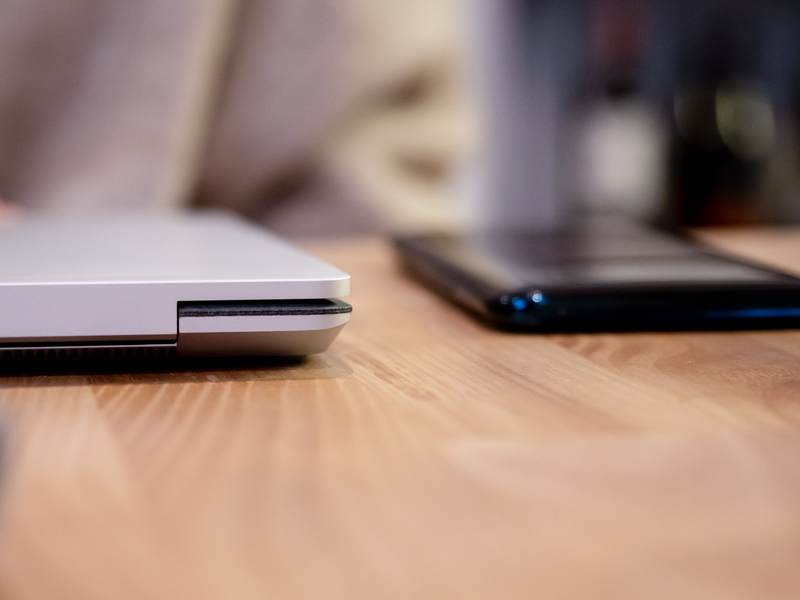 The aluminum housing is also very stiff and solidly made, and the flap can be opened with one finger, which is the norm in Apple computers, but rare in Windows 10 computers. Although the screen is of great importance at work, in the case of Surface Laptop 2, we can confidently include it in the "look" section. The 13.5-inch 2256 x 1504 touchscreen and 3: 2 aspect ratio looks great. Objectively speaking, it's not as good a screen as in Surface Pro 6 or Surface Book 2 . It has a lower resolution than both and is larger than Surface Pro 6, thus offering lower pixel density. Also the contrast is lower than in the other Surfaces, so the Windows 10 beam does not "blend" so smoothly with the bottom frame of the screen. There is also a significant leak of light at the bottom of the display, although it does not affect everyday work. The above paragraph does not change the fact that in the vast majority of users, the Surface Laptop 2 screen will cause the jaw to fall. And even the more demanding buyers - graphic designers, photographers, designers - will accept it with a hand kiss, because the sRGB color palette displays it faithfully and beautifully, and also supports the Surface Pen, although it is useful less than in Surface Pro 6, due to for classic device design. The Surface Laptop 2 speakers are beautiful, though ... they can not be seen at all. Microsoft used a very interesting solution, created in cooperation with Dolby. Well, the loudspeakers are placed under the keyboard and use the entire surface for resonance. As a result, we get an unexpectedly loud, clear and full sound. In the world of mobile computers only Matebooks from Huawei and Apple MacBooks offer better audio. At the same time, I would have to compare Laptop 1: 1 to clearly determine whether the difference between them is significant. MacBooks, unfortunately, are still playing in their own league when it comes to built-in speakers. No manufacturer has even approached them so far. Surface Laptop 2 does a great job at work. Without any "buts". I tested the configuration with an all-round average: a quad-core Intel Core i5 8 gen. Processor, combined with 8 GB RAM and a 256 GB SSD drive. In recent weeks, however, I could not say that the computer lacks power for the tasks I set before it. Of course - this is not a device for video editing in 4K, at the same time opening 25 cards in Chrome or gaming at the highest graphic settings. However, as long as we work in the office package, we stick to the rational number of cards in the browser, and the video assembly will be limited to Full HD (or 4K with the use of proxy), as long as Surface Laptop 2 fulfills all the challenges posed before it. Without much of a problem, I also launched older or less-demanding games like TES V: Skyrim, Firewatch or Alan Wake (of course in Full HD and medium / low settings). Interestingly, Surface Laptop 2 is characterized by a better working culture than Surface Pro 6 , which I tested in identical configuration. The fan can not be heard most of the time, and when it is turned on, it is completely non-invasive. The housing also heats up to a much lesser degree, although it may simply result from a physically larger area after which heat is discharged. I did not notice a problem with squeaking coils under load, which I noticed in Surface Pro 6. My job is primarily writing texts and photo editing. And through this prism I assess every computer that falls into my hands. When it comes to writing, the Surface Laptop 2 is the absolute best device I've ever tested. It consists of two factors: a 3: 2 screen, which holds more content vertically than most displays, and a keyboard. 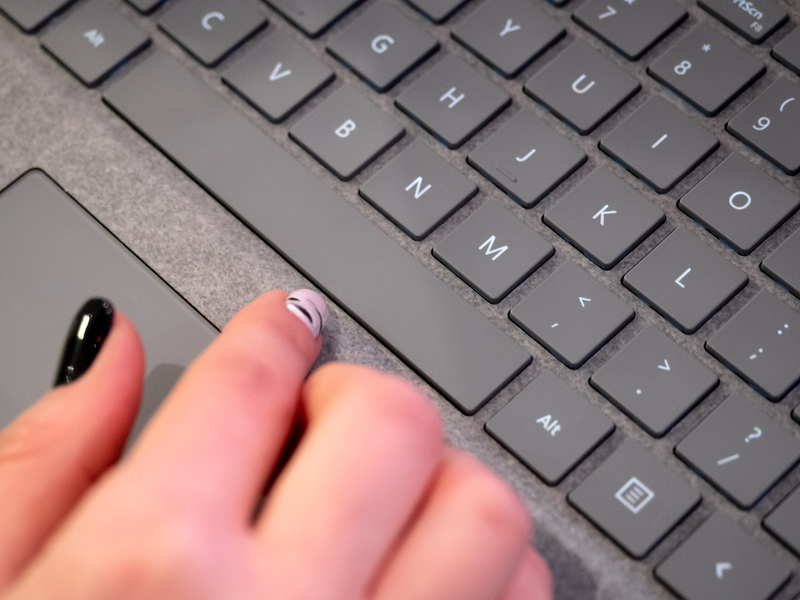 Let me put it straight: the Surface Laptop 2 keyboard is a masterpiece of engineering. Perfectly balanced, with a perfect jump and a nice reflection. 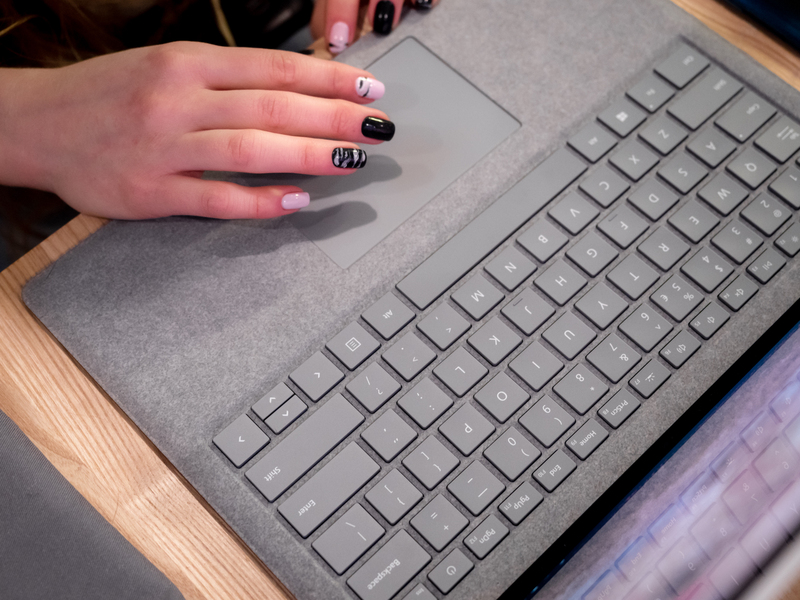 For this, the angled laptop base along with the Alcantara make it easier to write on a Microsoft computer than on any other laptop. Even Surface Book 2 and the Thinkpad X1 Carbon, which also feature excellent keyboards, are not as good as the Laptop 2 surface. This computer is simply designed to be a mobile typewriter. I can direct slightly less warm words towards the trackpad. The glass panel with Windows Precision gesture support is very good, and compared to many competitors it is excellent, but it does not equal Surface Book 2, Matebook X Pro or the unmatched in this aspect of MacBooks. In everyday use, we can also count on a long working time. Without much effort I pulled out 8 hours away from the socket with a combination of text editor, browser, Spotify and almost the highest screen brightness. I also always love the fact that Laptop 2 is charged via a magnetic connector; I hope that Microsoft will not abandon this solution in the future, because more than once it can save the computer from an unexpected flight towards a hard floor. Surface Laptop 2 does not cause any problems. And that's a real rarity. If you were to evaluate Windows 10 through the prism of most partners' equipment, it is really difficult to like this system. If, however, on every Windows hardware he would behave like on Surface computers, supporters of macOS would lose their crowning argument for staying with Apple's equipment. For several weeks of work Surface Laptop 2 never surprised me with an error message, a problem with drivers or an unexpected update. Windows 10 on Surfaces behaves perfectly. 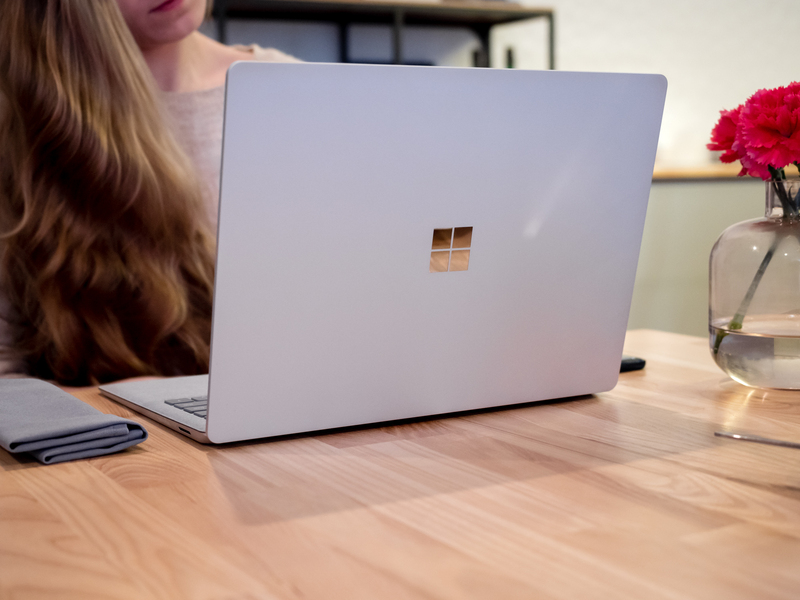 I am also very happy that Surface Laptop 2 goes to customers with Windows 10 Home or Pro (depending on whether we buy privately or as a company). The first laptop was distributed with a truncated Windows 10S, which completely did not fit the capabilities of this computer. The quality of the operation of the camera coupled with the Windows Hello is also invariably fascinating. Surface Laptop 2 is ready to work in the same second, in which we will lift the computer cover. Unlocking is instant and has lasted up to 100% over the last few weeks, even in total darkness. Let's talk about the disadvantages. Fortunately, there are not many of them. And very well, because spending from 5 to 12 thousand. zlotys for a mobile computer (the configuration tested costs 6399 zlotys), we expect it to be as close to perfection as possible. A few problems, however, were found. The first and most important are the ports: Surface Laptop 2 offers only one USB-A port, minijack and miniDP socket. As with Surface Pro 6, I think it's absurd that Laptop 2 does not have a Thunderbolt 3 or USB-C slot. As for the equipment that debuted in 2018, the expansion options for accessories are very archaic. I am also very much in the area missing the SD card slot. In a small Surface Pro 6 I'm able to accept it, but in Laptop 2, there would definitely be room for such a connector. 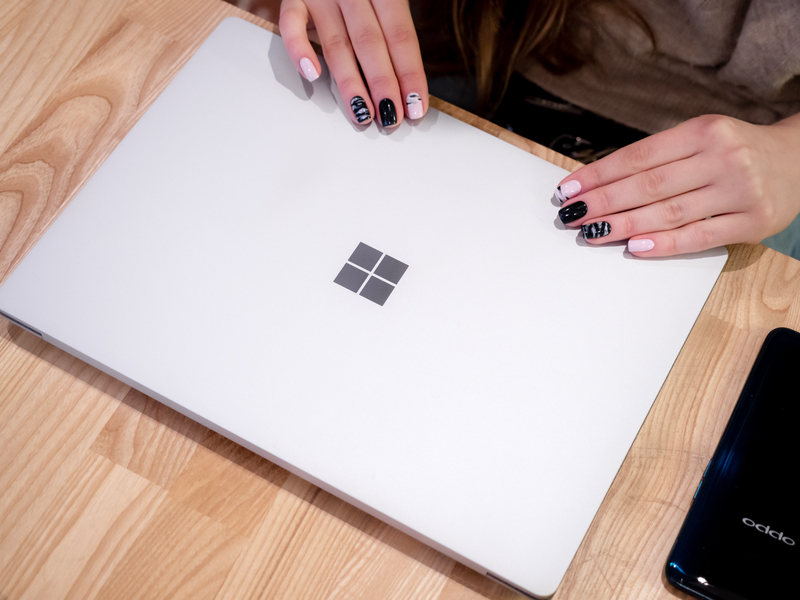 I could also blame that Surface Laptop 2 does not have a dedicated GPU, but it is due to the fact that it debuted before the Nvidia MX150 system spread in mobile computers. Like Surface Pro 6 , Surface Laptop 2 also shows a lot of battery drain while streaming video over Wi-Fi. While the office work for a long time the computer works on a single charge, so watching the Netfliks TV series and clips on YouTube, it often exhausts itself after 4 hours. I also noticed a construction defect that does not interfere with everyday use, but may have negative consequences in the future - the flap does not fully close. Around the Laptop 2 screen, we will not find typical rubber gaskets that protect screens on most mobile computers. Here the screen "puts" directly on the keyboard, and additionally, when you press the Microsoft logo with the flap closed, you can press it gently, like a lid of a previously opened jar. And as we are talking about the longevity of Surface Laptop 2, I'm afraid that it is quite ... miserable. The iFixit service evaluated the first generation of the computer (with the same design) as "unrecoverable", so in the event of a failure there is only an official service and replacing the device with a new one rather than repairing the damaged subassembly, I have doubts about the alcantara - if it is beautiful, pleasant in touch and you can clean it when it gets dirty, so I have the impression that after several months of intensive use the edges of the laptop, where alcantara blends with aluminum, may stop to look nice. Ah, and I have to say - the Polish consumer should feel aggrieved because of the lack of a black color variant on our market. Surface Pro 6 in a black mat looks phenomenal and I'm sure that Laptop 2 would look even better. Unfortunately, such luxury is guaranteed only to masters from wealthy nations. For the Pole, the platinum version remains (still beautiful, but not so unique). Surface Laptop 2 is fully worth the price. 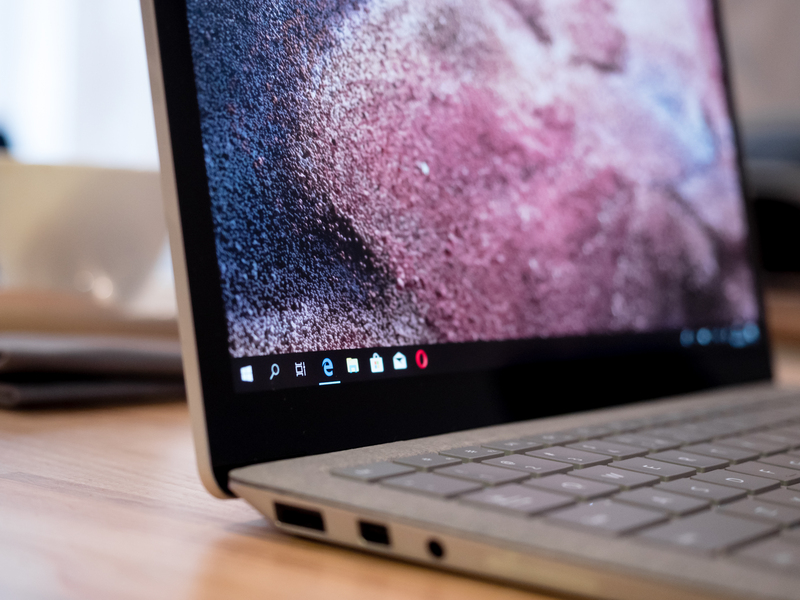 In the segment of ultrabooks with Windows 10, basically only Matebook X Pro from Huawei can match Surface Laptop 2 with the quality of performance and the level of attention to detail. For PLN 6,399, we also get a computer that does not diverge with its beauty and functionality from the more expensive MacBook Air, and outperforms it significantly in terms of performance and offers a better keyboard by the sky. 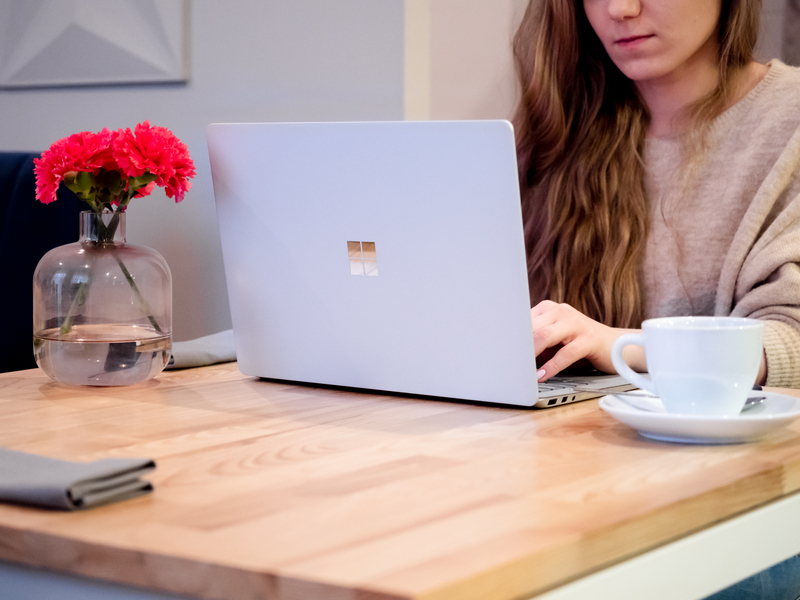 Surface Laptop 2 is a great proposition for those who expect from a laptop computer a combination of sufficient performance, beautiful appearance and mobility. And Microsoft's hardware fits these needs perfectly. 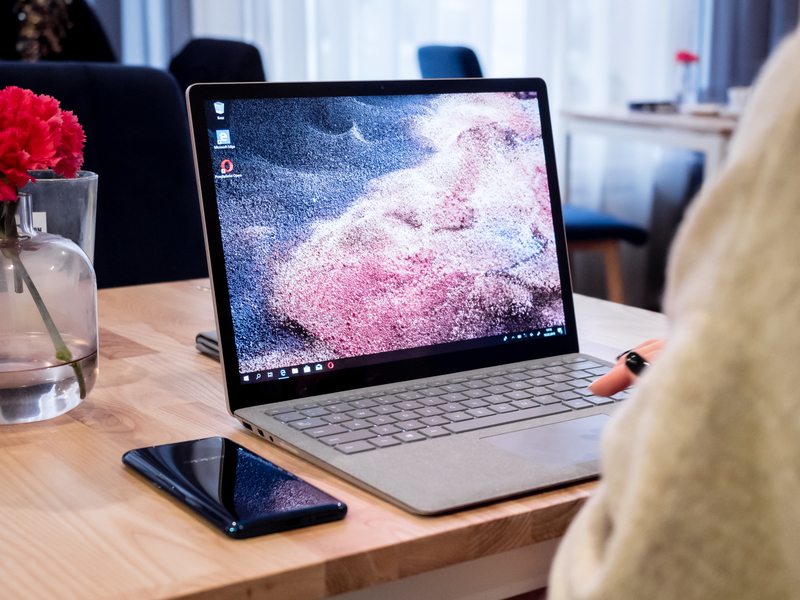 And although I personally prefer Surface Pro 6, due to the smaller size and more interesting form, for the majority of buyers looking for a premium ultrabook in a classic (but not ordinary) edition, Laptop 2 will be the best choice from the Microsoft stable.